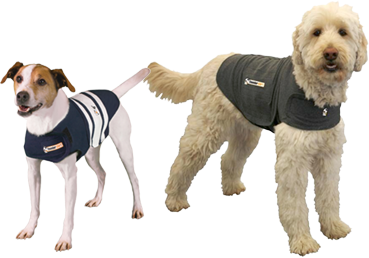 Thundershirt’s patent-pending design is a pressure wrap that applies a gentle, constant pressure on a dog’s torso. From real world experience, we know with certainty that Thundershirt DOES WORK. A survey of Thundershirt users shows that over 80% of dogs show significant improvement in at least one anxiety symptom when using Thundershirt. TTouch dog trainers use pressure to address a variety of anxieties. Some autistic people use pressure to relieve their persistent anxiety. Good question! With millions of dogs suffering from anxiety, it amazes us that such an easy to use, inexpensive solution like Thundershirt isn’t more widely known and used. If you would like us to speak with your veterinarian, please contact us. For many types of anxiety… none! Just put Thundershirt onto your dog and you will likely see results with the very first usage. However, for some dogs, it may take two to three usages to see results. For some more serious anxiety cases, such as severe separation anxiety, you should consult a good trainer for how to integrate Thundershirt into a training program. For more information on how to use the Thundershirt, please click here. We highly recommend that you measure your dog according to our Sizing Guide page to select the right sized Thundershirt for your dog. However, we do understand that there may be instances where you may still need a different sized Thundershirt. If you purchased your Thundershirt directly from Thunderdogs Malaysia and you need a different sized Thundershirt for your dog, we will be happy to exchange it providing that the Thundershirt has not been used (apart from trying it on), is clean and free of dog hair. Thunderdogs Malaysia reserves the right not to exchange a Thundershirt if the item is deemed damaged or dirty. Please drop us an email to obtain the return address, and send it back, within 14 days of receipt, with the complete packaging, with a note stating the new size you’d like. Please note that an additional charge of RM25 will be applied for postage and packaging. Thundershirt is made with durable, washable fabric. When necessary, Thundershirt may be HAND-washed or machine-washed in a regular cycle using regular laundry detergent and cold water. We recommend using a laundry net for your ThunderShirt in the washing machine. Hang to dry. If necessary, to remove dog hair from your Thundershirt’s fastener hooks, we recommend using a standard dog “slicker” brush (Available at most pet stores). A couple of strokes and the fastener hooks will be nearly completely hair-free. Thundershirt is designed to be safe to leave on your dog for extended periods of time when appropriate for the situation or issue that you are addressing. Thundershirt is made out of light-weight, breathable fabric, so over-heating is very rarely an issue. When properly sized and properly put on with a comfortably snug fit, your dog should be very comfortable for extended periods. It is typically safe to leave a dog unsupervised while wearing a Thundershirt. During the initial periods, we do recommend removing the Thundershirt frequently to check for any signs of irritation points. Irritation points are very rare, but best to be cautious. Is overheating a concern when using the Thundershirt? Except in extreme conditions (e.g. 90 degrees Fahrenheit or 32 degrees Celcius in the sun), overheating is not typically a concern when using a ThunderShirt. Dogs cool themselves primarily through their mouths and paws, and a ThunderShirt is constructed of a thin, breathable fabric. In fact, the state of Florida in the USA is one of our biggest markets. But if you feel that overheating might be a problem for your particular circumstance, please monitor your dog for any signs of overheating such as heavy panting or tongue hanging out of the mouth. Remove the ThunderShirt if you see any signs of overheating. We designed Thundershirt to be very easy to put on your dog, even if she is already in a state of anxiety. Click here to see detailed illustrations. Payment information will be sent to you via PayPal, and your items will be put in the post within 7 working days of receipt of payment.